It’s hard to believe that my mountain walking holiday in Scotland was almost 3 months ago. Long, hot, dry days and clear visibility meant we were privileged to enjoy the mountains, lochs, islands, moorland, waterfalls and woods at their best. In our modern gear we ascended 13 Munros (mountains over 3000 feet) in the Glencoe/Ben Nevis area. We enjoyed similar views of dozens of peaks, walking in snow near several summits, still lying there even in late June. 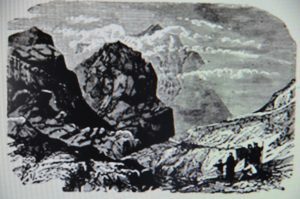 Yet, it’s a sombre, rugged valley that remains an unforgettable highlight: Glencoe, shown in this old print with several walkers admiring its grandeur. Towering mountains on each side dominate the ice-gouged valley. Motor vehicles drive up and down it on the A82 (maybe stopping to photograph a bagpiper in a lay-by). Walkers use the West Highland Way, following an old military road and a track. The splendid new Visitor Centre has amazing audio-visual presentations as well as displays about its wildlife, geological and human history. In several ways, though Glencoe has been a valley of shadows, with signs of human upheavals and catastrophes still visible today. A slender memorial with a cross on top, on the edge of Glencoe village near the river, commemorates the Glencoe massacre of 1692 , when 38 men, women and children of the MacDonald clan were murdered by troops (including some from the Campbell clan) carrying out government orders. Like communities all over the UK, even though it’s such a small village, Glencoe also has a separate memorial to those killed in the two World Wars. Several climbers have sadly fallen to their deaths and other people have lost their lives in road accidents.